It's not perfect, but the Apple Watch Series 4 will be the first over-the-counter heart rate monitor. We all heard the highlights: iPhones are about to be a little better, iPads will come with more efficient batteries and computers’ more spacious hard drives won’t fill up so quickly. In fact, Wednesday’s #AppleEvent was a three-hour walkthrough of pretty incremental advances in already-ubiquitous devices. It was kind of ho-hum — except for one standout announcement. 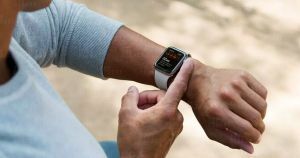 The Apple Watch Series 4 comes with an app and a built-in heart rate monitor, making it the first ever over-the-counter electrocardiogram (EKG), according to STAT. This gives the gadget, which will cost $399, the potential to radically redefine how we all think about consumer medical devices. The Apple Watch Series 4 is the first ever over-the-counter EKG, which gives the device the potential to radically redefine how we all think about consumer medical devices. The device can’t replace to a trip to the doctor, but it might help more people realize they need to see a doctor in the first place — perhaps before they encounter heart trouble. Between three and six million people in the U.S. have atrial fibrillation, the most common type of irregular heartbeat, according to the Centers for Disease Control and Prevention (CDC) — a number that’s expected to rise in the coming decades. And as Slate reported, people with atrial fibrillation have a much higher chance of having a stroke. Apple has reported that the app will only provide accurate readings for people older than 22 who haven’t already been diagnosed with an irregular heartbeat. That’s one of several limitations to what the new Apple Watch EKG tech will be able to do, as The Verge pointed out — it may also cost too much for those who face the highest risk of heart disease and requires that people actually wear the watch at all times. But if you’re in the Apple Watch’s primary demographic (read: young, trendy, healthy, rich), the device could be of use if you suspect something’s off with your heart. The new device could help those people visit to their doctors equipped with relevant data about their hearts that they captured in real time. If they weren’t wearing the device, then the doctor might just be guessing at whether or not there’s cause for concern. The U.S. Food and Drug Administration (FDA) has cleared — not approved — the Apple Watch’s EKG capabilities. That may sound like a troublesome distinction, but it just means that the FDA deemed the device similar enough to existing EKGs to not warrant additional testing. This is the same approach taken by standalone EKG apps and sensors that were available on previous iterations of the Apple Watch — because there’s no radically-new technology in the heart rate monitor, there’s no legal requirement to subject it to more rigorous testing. And because the Apple Watch has now made consumer medical devices as discrete as, well, a watch, people can keep an eye on their vitals without facing any of the stigma or discomfort that may come from carrying around a more obvious gadget. It’s too soon to say whether or not the Apple Watch’s built-in EKG capabilities will deliver on these lofty promises — the heart rate monitor app announced Wednesday won’t be available until well after the Apple Watch Series 4 launches. But if it does, it could be the first step towards an era of accessible, wearable medical devices keeping an eye on us.